Salt and prepare the meat, firmly wrap it up with a transparent film and freeze it. Once freeze it, remove the film and cut it in very thin slices just covering every single plate you have to serve. Flavour the meat with a shred of oil. Clean the rocket, dress it with oil, salt and pepper and freely lay it down on the carpaccio. Complete the plate with some petals of Parmigiano-Reggiano. Julienne the onion and make it sauté in butter. Clean the spinaches, wash them, drain them and add them to the sauté. Dry the spinaches out in a pot without the cover, add potatoes (cut in small stripes), a pinch of salt and then the grated Parmigiano-Reggiano. Make them cook for a few minutes then add water just to cover all the ingredients. Let them boil for 15 minutes and then blend all the ingredients. Combine the mixture with the heavy cream. Serve the soup of spinaches decorating the plate with petals of Parmigiano-Reggiano and a shred of Traditional Balsamic Vinegar. Blend the butter until you obtain a cream then add the aromatic herbs finely cut. Envelop the mixture in a plastic wrap and put it in the fridge. Peel the tomatoes, remove the seeds and cut them in pieces. Then put in a pan olives oil and tomatoes, capers, olives, salt and pepper. Separately cook the tagliatelle, drain them then put them in the pan with the gravy and blend for a few minutes. Remove the pan from the fire and add to the pasta the butter at the end put grated Parmigiano on the pasta and your plate is ready! We suggest you to use an innovative packaging called “OVTENE” formed mainly bu Calcium Carbonate which granted the freshness and the storage of the cheese for a long period. This type of packaging you'll find it in our shop at the Cheese-factory. 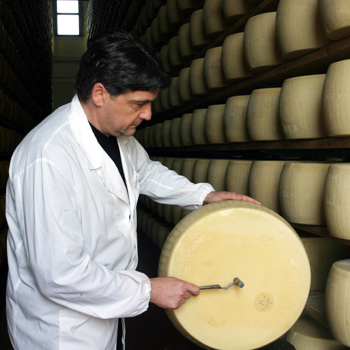 To cut Parmigiano-Reggiano, you necessarily need to use the typical instrument. We're talking about the typical knife, with a very small and sharp blade with an almond shaped. You don't have to cut the Parmigiano-Reggiano's wheel but you have simply to open it to make unaltered the internal structure and the natural granularity. With the point of the almond shaped knife create a line that cut in two the cheese wheel on the diameter of the two faces and continuing on the side (or scalzo). Slice the crust on this line cutting in stops and starts the Parmigiano-Reggiano for a pair of centimetre depth: in the two last points of one face's diameter, in half a side, you strongly stab two almond shaped knifes. 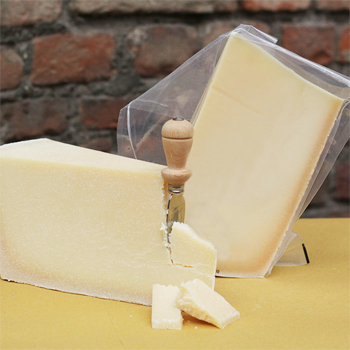 In this way, using knifes as wedges, the strength enhanced allow you to open the cheese-wheel in two parts.